Turmeric is a bright yellow spice often used in Asian cooking. Turmeric contains the active ingredient curcumin, which is an antioxidant that demonstrates anti-inflammatory properties in conditions such as arthritis, muscle sprains and other injuries. In addition, turmeric may prevent and slow cancer growth, protect against liver disease and help reduce symptoms of digestive conditions such as irritable bowel syndrome. While simply adding turmeric to your daily cooking will increase consumption and enhance flavor, there are other methods to boost intake and encourage possible inflammation reduction. While the use of turmeric in traditional Asian cooking, such as curries, is common in the kitchen, a hot beverage is another way to enjoy the spice and treat potential inflammation. To make a pot of turmeric tea, simply boil 4 cups of water and add one teaspoon of ground turmeric. Simmer for 10 minutes before straining into a cup. Add lemon or honey to taste. Adding ginger provides an additional natural anti-inflammatory. Another method for addressing inflammation with turmeric involves a topical application. Turmeric powder mixed with ingredients such as warm water, warm milk or sesame oil creates a paste that, when applied to the skin, helps to reduce inflammation and swelling. In Ayurvedic medicine, turmeric paste is often used to cleanse wounds, reduce inflammation and promote healing. 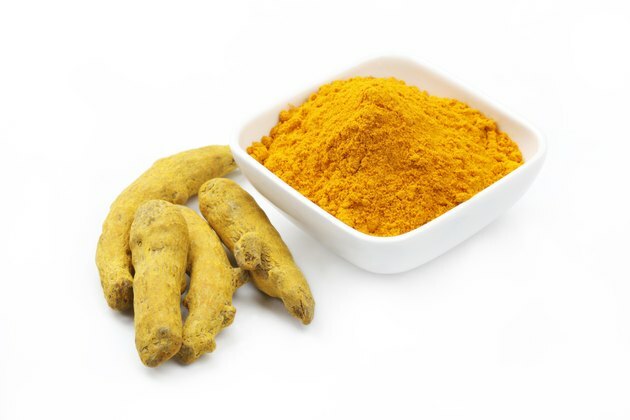 If the taste of turmeric is not appealing, dietary supplements offer another method of increasing turmeric consumption to aid in the reduction of inflammation. Director of integrative medicine at Northern Westchester Hospital in New York, Dr. Minerva Santos, recommends 1,000 milligrams of turmeric supplements per day for patients suffering from joint inflammation, while the University of Maryland Medical Center recommends 400 to 600 milligrams three times a day. Turmeric supplements are available in tablets or capsules. While small quantities of turmeric in general cooking are considered safe, larger doses can pose risks for people with certain medical conditions or who are taking certain medications. Before adding increased quantities or turmeric to your diet or taking dietary supplements, talk with your physician about any possible complications. Large amounts of turmeric can cause stomach upset and ulcers. Turmeric can cause a drop in blood sugar levels when taken with diabetic medications, as well as interfere with blood clotting in patients taking warfarin or similar medications. Andrew Weil, M.D. : Can Herbs Combat Inflammation?